Back in 2010 we conceptualized numerous iterations of Kitchener-Waterloo border installations for Contemporary Art Forum Kitchener + Area (CAFKA). We decided on an ambitious wooden installation which will sit in a shallow pond at the city hall nearby. Our text installation, which will read REFLECT ON HERE, will need some thorough planning. For this reason, we spent most of yesterday evening constructing the faces of a test-letter (R) from plywood sheets measuring 8’x4′ each. After a long day of classes and studying, a few friends of mine wandered into the Lebel gallery to let loose and make ridiculous things out of heaps of cardboard boxes. The creating of the ‘box city’ was open to anyone curious enough to take part. Of course the essentials (boxes, scissors, coloured tape, paint and brushes) were supplied and all that was required was a bit of imagination! 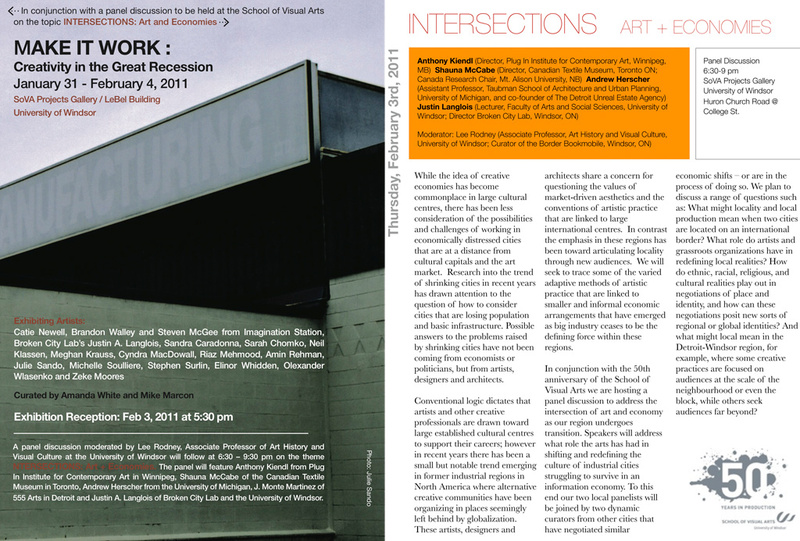 I’m excited to note that in addition to the current exhibition, Make It Work, on at SoVA Projects Gallery (nee LeBel Gallery) featuring work by Michelle, a new poster installation that I did, and a ton of other incredible local Windsor-Detroit artists, there’s a panel discussion featuring guests from across the country. If you’re remotely interested in some of the things we talk about here on the blog, you should really make a point of attending the reception and panel discussion on Thursday, February 3rd, starting at 5:30pm. While the idea of creative economies has become commonplace in large cultural centres, there has been less consideration of the possibilities and challenges of working in economically distressed cities that are at a distance from cultural capitals and the art market. Research into the trend of shrinking cities in recent years has drawn attention to the question of how to consider cities that are losing population and basic infrastructure. Possible answers to the problems raised by shrinking cities have not been coming from economists or politicians, but from artists, designers and architects. What might locality and local production mean when two cities are located on an international border? What role do artists and grassroots organizations have in redefining local realities? How do ethnic, racial, religious, and cultural realities play out in negotiations of place and identity, and how can these negotiations posit new sorts of regional or global identities? And what might local mean in the Detroit-Windsor region, for example, where some creative practices are focused on audiences at the scale of the neighbourhood or even the block, while others seek audiences far beyond? The Magnetic Planters project continues. With Michelle and Danielle away this week, the rest of Broken City Lab had to relearn the process of making paper pulp. It was a good night, though we’re hoping to get this project finished in the next week or so. As Intersession begins, we’ll be shifting our Office Hours to another yet-to-be-determined day, and it might even be biweekly until July. We’ll keep you posted.